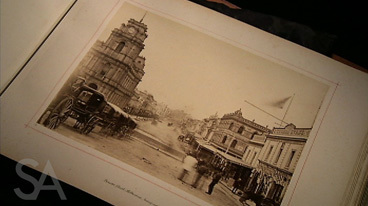 Video clip synopsis – Artists working in different media have created a visual time capsule showing Melbourne in the late 1800s. Broadband MP4 photopainter_bb.mp4 (19.1MB), suitable for iPods and computer downloads. Artists working in different media have created a visual time capsule showing Melbourne in the late 1800s. The first, an album of photographs by the city’s official photographer Charles Nettleton, features Bourke Street, Melbourne, Looking East, an 1878 photograph showing men chatting in the middle of sleepy Bourke Street, while the second, a painting by Tom Roberts circa 1886, shows the same street bustling with pre-Christmas trade. The painting, originally named Allegro con brio, was altered in 1890 when the artist added three figures to the foreground. Aerial maps of the city in the National Library collection show the massive transformation that took place in Melbourne over the fifty years from 1838. The photograph, the painting and the aerial map provide snapshots of early Melbourne, each one supplying information particular to the medium. This episode of Hidden Treasures presents a variety of photographs and paintings as evidence of change over time. Discuss the strengths and weaknesses of both photographs and paintings as evidence of a place or event in history. One of the important elements in evidence is the influence of the creator of the evidence. A painter chooses what to include in his or her painting. Does a photographer also influence or choose what is in a photograph and therefore what meanings or messages it conveys? Discuss this idea. How has changing technology influenced the nature of photographs? Summarise in just one or two sentences why these paintings and photographs are ‘treasures’ in our knowledge and understanding of aspects of Australian art history.